A lightweight and compact range of plain bearing extruded aluminium sliders, running on 20mm ( ¾" )'T' Track and finished in our unique spectro grey anodised finish. Features a precision turned Ertalyte sheave, through-bolted for extra strength. The positive action plunger mechanism has an easy-grip knob. With tow eye or sheave in place of plunger, allowing a control line to lead aft so that Genoa car adjustments can be made from the cockpit. use in conjunction with end fittings shown. A strong unit will accept most Barton Blocks - with a stainless steel attachment loop, through bolted for strength. With a swivelling bullseye that will always accommodate the correct angle of sheeting. Accepts lines 14mm diameter. A stainless steel insert is provided to prevent wear. Features a plain moulded plastic fairlead fitted to an adjustable slide. Accepts lines up to 12mm diameter; not suitable for high loads. Has a stainless eye fitted to a stainless loop, through-bolted for strength. The moulded plastic spring/gaiter prevents the block tumbling or ropes snagging. 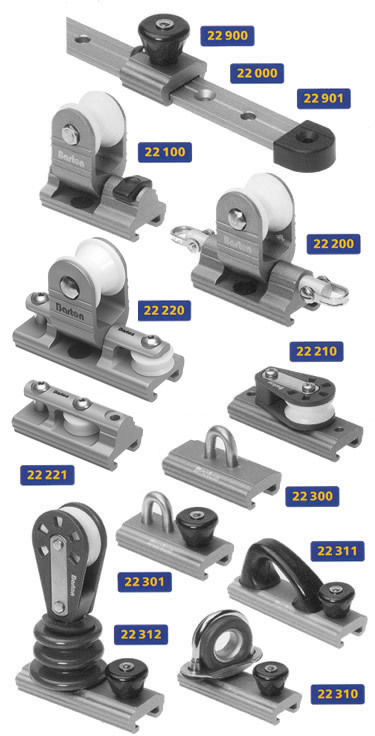 Supplied with a size 2 block accepting lines up to 8mm diameter. For use with mainsheet or genoa track sliders. Sold singly.